Every year since 2006, Walt Disney World has released a Disney Free Dining discount, typically for Fall dates, though early on we did see some Spring dates included. The Disney Free Dining discount for 2018 was released earlier this week. Historically, this is the most popular and most looked forward to discount for regular Disney visitors. The basics are the Disney Free Dining discount is that you book a package at a Walt Disney World resort that includes your hotel and park passes, and Disney includes the dining plan for free. But, it really isn’t free. One thing to note here, Disney DOES NOT love you, they are not giving you something free because you have been a great customer, or because they think you deserve it, Disney releases discounts, whether free dining or any other package or room discount, to fill rooms. If there is a time when they can’t fill up at full rate, they offer an incentive to get you to come to Disney. Disney Free Dining is just another marketing scheme to get you to come to Disney. Plus, Disney is smart, they know that when people hear “free” they go crazy and don’t even consider doing any math to see if it really is free, or even if it is a good deal. Minimum Night Stays – As part of the 2018 Disney Free Dining discount, Walt Disney World requires you to stay a minimum of four nights, a maximum of 14. While this really does not affect many people, there are some that may want to visit Disney just for 1 or 2 nights, but must extend their vacation an extra day or two in order to get free dining. Minimum Ticket Purchases – Disney requires the purchase of a minimum 4 day ticket with you Disney Free Dining package. This is a requirement regardless of the length of ticket you really want. If you are an annual passholder, you still must purchase a 4 day ticket. If you are a Florida Resident and have access to cheaper tickets, still, you must purchase a 4 day ticket. If you have tickets left over from another trip or happened to purchase tickets elsewhere, everyone on the package must purchase a 4 day ticket. While this doesn’t sound like a huge deal, a 4 day base ticket is roughly $405 per person, so for a family of 4, you are talking a minimum ticket purchase of $1,620 just for the right to get the free dining. Park Hopping Add-on – Another requirement added in recent years, in addition to purchasing the minimum 4 day ticket, Disney also requires that you purchase the park hopping add-on for everyone in your room. The park hopping add-on runs about $75 per person, so a family of four must pay an additional $300 whether they want park hopping or not. Limited Resorts – As part of the 2018 Disney Free Dining discount, Disney did not include many of the popular resorts as part of the discount. Want to stay at Port Orleans Riverside or French Quarter or a Little Mermaid room at Art of Animation? Contemporary or Wilderness Lodge? All-Star Movies?You are out of luck. Plus, many of the resorts were included, but have zero availability? While this doesn’t necessarily increase your cost, you may have to stay in a resort that you have no interest in staying in just to get a discount. Many of my clients have actually had to upgrade to a more expensive resort to get the Disney Free Dining, they want to stay in a Value resort, but because they are all sold out, they are forced to pay more and upgrade to a moderate resort just to get a discount. More expensive rooms – Availability with Disney Free Dining is very tight. While you may find a room at Pop Century (your preferred resort), they may be sold out of the standard view rooms you normally stay in. So, you are forced to upgrade to a more expensive room just to get a discount. Bypass other discounts – At Walt Disney Wold, you are not allowed to use more than one discount. Even though Disney released two discounts the other day, the Disney Free Dining and the Late Summer discount, which overlap for many of the Disney Free Dining dates, you cannot use both discount. So, if you opt to take the Disney Free Dining discount, that means you exclude yourself from the Late Summer or any other discount that comes along. 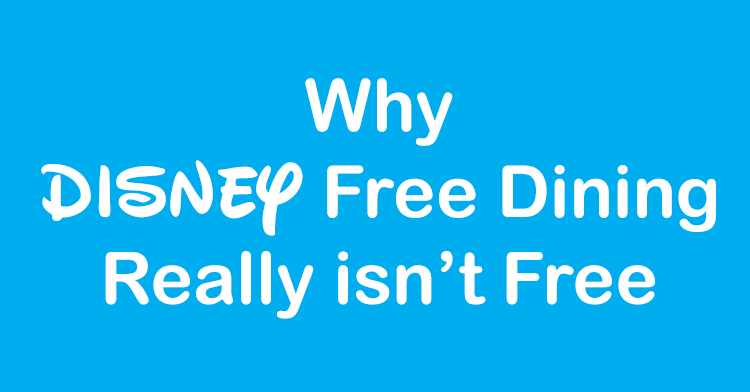 I am not saying that the Disney Free Dining discount can’t be a great deal, but DO THE MATH! I have clients that can get a better deal with a different discount, they insist they still want free dining, because it was “free”, even though they end up paying more in the end. Sometimes it is hard to understand that free really isn’t free. When booking your Disney vacation, I would strongly suggest to book your initial reservation at a price you are comfortable with, and do not expect to see any discounts. Then, if and when a discount does come along, consider that as a bonus and upgrade your resort or dining plan and have a better trip than what you were expecting. Steven – Disney has never offered the free dining discount during the Summer. Due to crowd levels, you kind of take the discounts offered and be happy you saved some money.